Everything was very good except breakfast. I ate elsewhere. May be d/t ongoing renovations in breakfast area. The staff was ver friendly and understanding. The hotel was quiet and very clean. Where to find Utica hotels near an airport? Where can I find hotels in Utica that are near tourist attractions? There are a good range of Expedia hotels to select from when it's time to start arranging your adventure in Utica. You'll find around 14 accommodation options are located within a 0.1-kilometre (0.06-mile) radius of Utica's town center. Booking convenient accommodation near the heart of Utica is just a couple of mouse clicks away. Expedia's comprehensive booking page lists the Hotel Utica and Radisson Hotel Utica Centre, which you'll find a short distance of the town center. New Hartford is an accommodation neighborhood that lies 6 kilometres (4 miles) from downtown and has 3 Expedia-listed hotels. Establishments in New Hartford are the Holiday Inn Utica and Hampton Inn and Suites New Hartford/Utica. Another popular place to stay is Rome. Rome is home to the Wingate By Wyndham Rome and Inn At The Beeches. Or, try Cazenovia, where you'll find the Brae Loch Inn and The Brewster Inn. Little Falls is 30 kilometres (19 miles) from Utica's downtown, while Herkimer is 20 kilometres (13 miles) from the heart of Utica. The Overlook Mansion and Canal Side Inn are located in Little Falls, while Bellinger Rose Bed & Breakfast and Red Roof Inn & Suites Herkimer are located in Herkimer. Thrifty travelers can relax. The Utica area offers plenty of keenly priced hotel establishments. The Inn At The Beeches is 25 kilometres (15 miles) from the main part of Utica, while the Microtel Inn & Suites by Wyndham Verona is 30 kilometres (19 miles) away. The Quality Inn Rome and the Ramada New Hartford are some other economical places worth investigating. 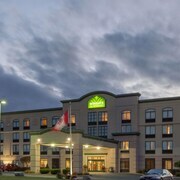 The Holiday Inn Express & Suites Utica is 1 kilometre (1 mile) from the heart of Utica. Or, alternatively, the Hampton Inn Utica is situated 1 kilometre (1 mile) away. Two other places to stay worth checking out around Utica include the Lake House and the Rosemont Inn Bed and Breakfast. Should you have the time, you could discover more of Central New York State. Nature lovers will love Central New York State's rivers and rolling hills. You could also head to its history museums, theaters and farms. In this part of United States of America tourists might also partake in cross-country skiing and snowmobiling. Cooperstown - Ostego Lake is 45 kilometres (29 miles) to the southeast of Utica and is home to the National Baseball Hall of Fame and Fenimore Art Museum. Expedia-listed Cooperstown - Ostego Lake hotel options are the Lake View Motel and Lake 'N Pines Motel. Or stay in Oneonta, 75 kilometres (46 miles) to the south of Utica, where you can choose from the Courtyard Oneonta and Hampton Inn Oneonta. If you're staying in Oneonta, set aside some time to visit the Hartwick College and Foothills Performing Arts Center. Hancock International Airport is a nearby airport, and can be found 70 kilometres (44 miles) from Utica. 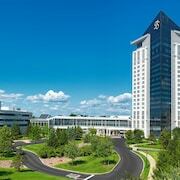 Hotels that are nearby include Residence Inn Syracuse Carrier Circle and Springhill Suites by Marriott Syracuse Carrier Circle. What are the most popular Utica hotels? Are there hotels in other cities near Utica? What other types of accommodations are available in Utica? Explore Utica with Expedia.ca’s Travel Guides to find the best flights, cars, holiday packages and more!